Pine Mountain Sports has been serving the adventurous for almost 20 years. Located on the road to Mt. 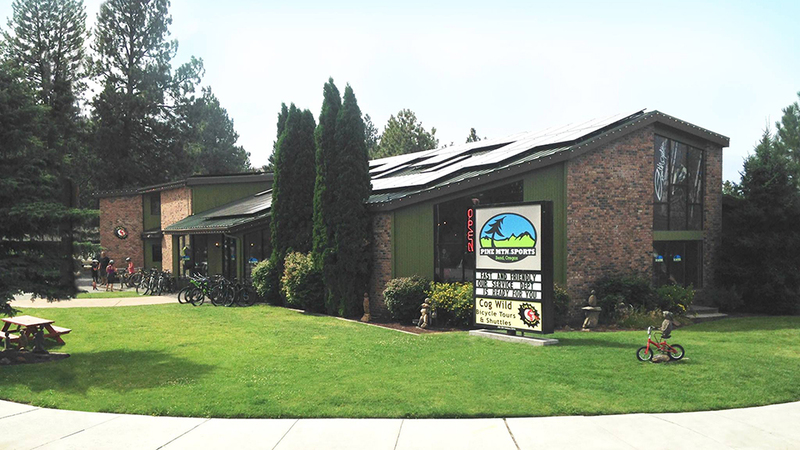 Bachelor and close to the trails at Simpson Ave and Century Dr., they have Bend’s largest mountain bike rental fleet with the most popular bikes from Trek, Santa Cruz, and Juliana. You can ride to the trails from the store. In addition to mountain biking (and don’t search for road bikes or townies here, they are 100% dedicated to bikes that love dirt), Pine Mountain Sports has everything you need to complete your backcountry skiing adventures, too. In addition to renting or selling you a bike, they can also help you take care of it at their Trek Certified Service department that’s ready with parts, accessories, and awesome support from Fox and Rock Shox certified techs. They routinely host community events from hot wax clinics to blood drives to lessons, and they also are big supporters of local outdoor-based non-profits. They have a nice selection of lifestyle clothing, sport nutrition and everything else you want your ski/bike shop to carry, including a staff that is friendly and familiar with their products and local trails.